Nearly one-tenth of the world’s electricity comes from fission-generated nuclear power, and most reactors use uranium dioxide or a mixed oxide containing 90% uranium oxide as a fuel. Although studies of the solid and its melting behavior are challenging as a result of the high temperatures required as well as the reactivity of UO2, data on the behavior of this material at extreme conditions is critical for engineering proper safety controls into nuclear reactor design. A number of molecular dynamics simulations of molten UO2 have been carried out, but these disagree with respect to the nature of the melt structure. Experimental measurements of the melting process would not only provide important data, but could also be used as a test of the theoretical simulation methods currently used to address this and related problems. Now, a group including EFree Research Scientist Malcolm Guthrie, have carried out synchrotron x-ray measurements of the structure factor of UO2, both in the heated solid prior to melting, as well as the melt, at the Advanced Photon Source at Argonne National Laboratory. 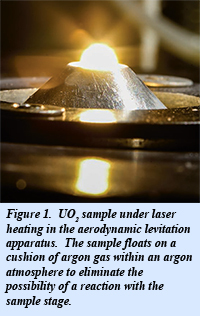 The measurements were made possible by utilizing an aerodynamic levitation method, which prevented any reaction between the UO2 sample and the sample stage. The sample was laser-heated from above, and x-ray measurements were made using only the top portion of the sample (Fig. 1). Optical pyrometry was used to obtain the temperature during heating to within approximately 100 K.
Analysis of the structure factors for both heated solid and molten UO2 yields the pair distribution function, which gives a measurement of the probability of finding atom pairs (U-U, U-O, or O-O) with a specific separation. 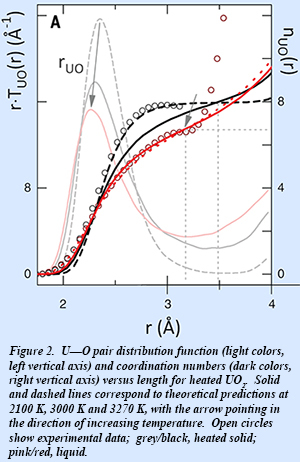 Coordination numbers as well as a determination of local disorder are determined from peak areas and widths, respectively. The results show that the heated solid shows considerable disordering in the vicinity of the lambda transition (~2670 K), but no significant coordination U-O coordination change. The U-O coordination number decreases from 8 in the solid to 6.7 in the liquid, as the U-O distance decreases concurrently (Fig. 2). The structural data for the heated solid and liquid obtained in this work will allow the formulation of accurate interatomic potentials that will in turn provide reliable input for multiscale models [L. B. Skinner et al., Science 346, 984-987 (2014)].